Cover Story: Go fish! 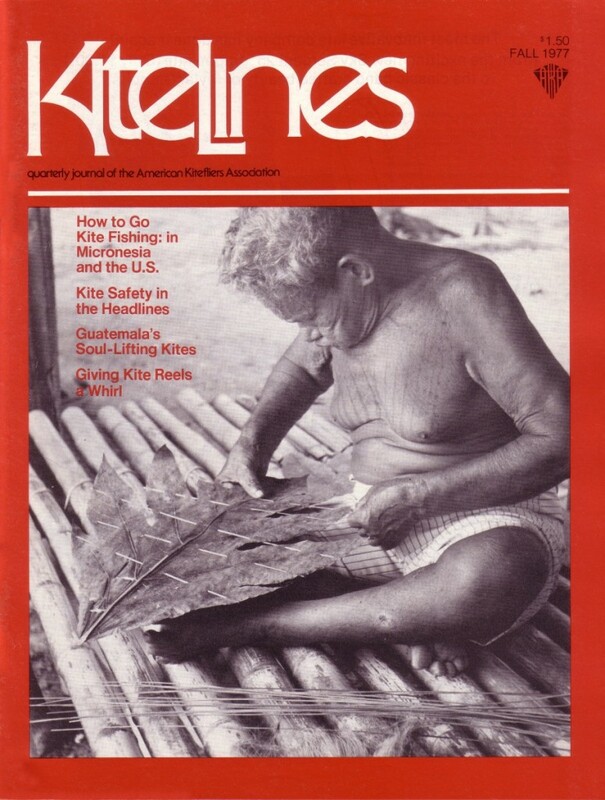 Articles on kite fishing by Wayne Baldwin (with photos by Baldwin) on the traditional use of leaf kites in Micronesia, and Warren “Stormy” Weathers on his own angling techniques with sled kites and how to make them. Features: Hall Hammond on the use of huge kites to celebrate All Saints Day in Guatemala; Dave Checkley on flags, banners and kites (including kites by Australian Peter Travis) in Seattle, WA; a safety report on the kite that started a major California fire, plus transcripts of the Consumer Product Safety Commission investigation of kite safety (which eventually led to the banning of aluminized Mylar in long-tailed kites). Departments: Letter from the Editor: the riches of the kiteflying rainbow; What’s New: Kite Reels, an overview, including a data chart and new styles; Design Workshop: Jack Van Gilders gull delta; Ultimate Questions: Ed Grauel on choosing tails; Profiles: Ted Manekin on Ansel Toney of IN; News from Here & There: the 5th annual Father’s Day Kite Festival in San Francisco, CA; John DeGange on 101-year-old kiteflier Thomas Vasiliou, CT; Will Yolen on the Sunrise Inn Rooftop Kitefliers of Fort Lauderdale, and a Florida State University Kite Fly Spectacular, FL; the Maryland Kite Society’s 11th annual Maryland Kite Festival in Baltimore; Gregory and Phyllis Apkarian on the 9th annual Great Boston Kite Festival, MA; Pat Gilgallon’s kite show in Detroit, MI; Art People Party devoted to kites at Princeton Battlefield and a kite contest in Ocean City, NJ; Dinesh Bahadur’s school workshop in Keene, NH; James Vullo’s magazine exposure at the University College in Buffalo, NY; the Galleon Esplanade’s 6th annual Kite Contest in Nag’s Head, NC; Bill Jones on the Lake Erie Islands Kite Festival, OH; George Turner on the Kiwanis 5th annual Kite Festival in Paris, TN; Richard Robertson on National Kite Day in Austin, a Lions Club kitefly in Rankin and a kite exhibition at the University of Texas Health Science Center in San Antonio, TX; Jack Van Gilder on events of the Washington Kitefliers Association, WA: Helen Bushell on the formation of the Australian Kite Association and her publication of a booklet on kite theories and R.E. Ted Padman’s news from the Kitefliers Association of South Australia; Jack Van Gilder on the Great Pacific Rim Kite Festival in Vancouver and David Pinner on his favorite stunt kite, Canada; kite enthusiasm from the May Day National Kite Rally of the British Kite Flyers Association and the 1st British Kite Championships in London; Jack Van Gilder on the travels of Dave Checkley and John Dusenberry in Japan; news from A. Darmenia-Gay of the Malta Kitefliers Group; Rento Brattinga on a midsummer kite festival in Amsterdam, Netherlands; news from the Waikato Kitefliers Club in Hamilton, New Zealand; Flying With the Old Pro: Bob Ingraham on gliding deltas; Kid’s Corner: Vietnamese Kite from Margaret Greger. Patricio Tahemaremacho makes kites in preparation for kite fishing on the small Pacific island of Palau . It is here recently that an environmental controversy has centered . A giant oil supertanker port has been proposed for this remote isle in the Micronesia chain. The proposal has accelerated the desires of the natives for independence from U .S . trust protection, and has created a classic confrontation between conservation and development . Wayne Baldwin, President of the Hawaii chapter of AKA, was in the right place at the right time to see Patricio working in the traditional manner of his ancestors . Except for the striped shorts, the picture could have been taken generations ago . “It was like striking gold to me,” Wayne confessed. Photograph by Wayne J . Baldwin.